An in-depth look into how the Hoover Police Department came to be what it is today. The city of Hoover was born on April 28, 1967, a tiny area “four blocks long and one block wide.” The “four blocks long” consisted of Whispering Pines Circle, Deo Dara Drive, Greenvale Lane, and Valgreen Lane. The population of the young city was four hundred and six people. 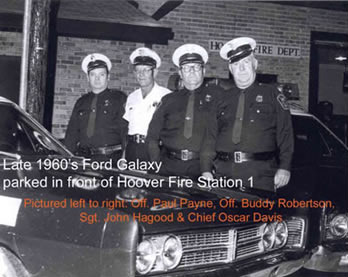 When Norrell got that car, a 1968 Ford Galaxy, the police department was housed in a tiny office in Hoover Fire Station One. Occasionally, the fire station restroom would function as a jail until the prisoner could be transported to Vestavia. In February of 1968 Chief Norrell hired Oscar Davis as a part-time patrol officer, and in March of 1968 Chief Norrell retired and passed the job of Chief of Police on to Davis, who would remain in the position for the next eight years, serving under Mayors Don Watts, O.E. Braddock, and John W. Hodnett during a period of rapid growth in the young city. At the start of his tenure, in addition to his service as Chief of Police, Chief Davis also functioned as city inspector, writing permits for new construction in the growing city, which had expanded from a few streets around Whispering Pines Circle to include much of the area currently in central Hoover north of I-459. The police force grew as well, expanding from a lone officer with a 1968 Ford Galaxy to seven officers, four Sergeants, and four dispatchers, with a fleet of six or seven mid 1970s Ford Police LTDs. Before hip surgery forced Davis’s retirement in 1976, the police department was finally able to move from the shared office space at Hoover Fire Station One to offices built specifically for police personnel in the new City Hall. From 1970 to 1980, the population of Hoover grew from a few thousand people to over eighteen thousand, mainly due to ongoing annexations in anticipation of I-459 and I-65 being completed through the heart of the city. In 1974, the department consisted of nine officers and four dispatchers, with officers working six days a week with no paid overtime, with one officer per shift during the week and two on weekends. As the demand of the growing city increased, eleven additional officers were hired between 1974 and 1978. Among these newly hired officers was the department’s first female police officer. Commenting to a Birmingham News reporter, she stated that the Hoover Police Department was her first choice because of its growth and progressiveness, and indeed the little city was growing and progressing rapidly. Police Chief David A. Cummings, who was appointed by Mayor John Hodnett in 1977, would look back on this period in a 1988 interview and tell the Birmingham Post Herald reporter that one of his tasks in the early days when he was first hired was chasing moonshiners out of the woods that would later become the site of the Riverchase Galleria. “It was a whole different world,” he said. Throughout the 1980s, Hoover’s growth continued exponentially. With the openings of I-459 and I-65 through Hoover, annexations occurring along US 280 and Shades Crest Road, the creation of the Hoover City School System, and the openings of the Hoover Met and Riverchase Galleria. Hoover had grown from the tiny town “four blocks long and one block wide” into a booming metropolis. 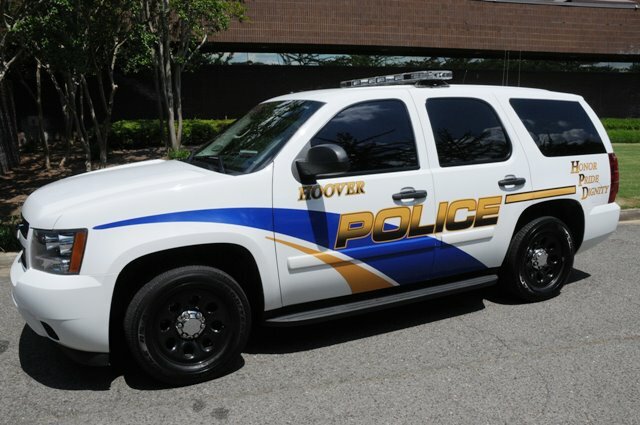 The Hoover Police Department also had to grow dramatically to keep up with the police service needs of the rapidly growing city. Between 1984 and 1988, the Hoover Police Department’s number of sworn officers more than doubled from thirty-three to sixty-eight. During this period in the mid 1980s, the average Hoover officer was twenty-eight years old, and more than half held college degrees. In August 1988, Birmingham Post-Herald reporter Steve Joynt wrote an article titled, “Despite yuppie jokes, Hoover Police take pride in their job.” A truer statement was never spoken. The Hoover Police Department was young, well-educated, highly paid, properly equipped, and exceedingly motivated. 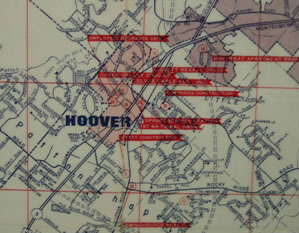 As Hoover continued its annexation along the US 280 corridor, its population increased from approximately eighteen thousand in 1980 to nearly forty thousand in 1990. By the end of the millennium, Hoover’s population would increase to approximately sixty-three thousand. The annexation that had the greatest impact on the Hoover Police Department occurred in the Inverness/Greystone area of Shelby County. 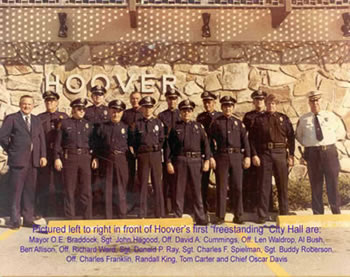 Even with all the new recruits of the 1980s, the City of Hoover simply did not have an adequate number of police personnel in place to patrol the area when annexations began in 1990. To compensate for the lack of personnel, additional patrol shifts were created and staffed by officers working an extra shift each week. Unlike those officers from the mid 1970s who worked six days a week for straight time, the officers of the 1990s received time and a half for these extra patrol shifts, and many officers doubled their salary during this time period. Just like the police department, the fire department was initially ill prepared to allocate personnel and resources to the Inverness area. In order to house firemen assigned to Inverness, the city moved a house trailer into the woods off of Inverness Parkway near Lake Heather. The official designation of this house trailer masquerading as a fire station was Hoover Fire Station Seven, but it was known as the “trailer in the swamp” among those who used it. Echoing those early days before the Hoover Police got their own station, many police officers relied upon the hospitality of the fire department and used the trailer as an operating base when assigned to patrol the Inverness community of Hoover. To create the funds necessary for the hiring of additional personnel for several departments, including the police, Mayor Skinner proposed a 1993 sales tax increase from seven to eight percent. It would be approximately sixteen years before the Hoover Police Department would be able to hire the sixty plus additional officers that it needed. Today the Hoover Police Department has grown from the tiny, one-man operation of 1967 to one of the largest and most advanced departments in the nation, bringing a large number of jobs to the Hoover community. Today it employs 166 officers in addition to 62 civilian (non-sworn) staff members. These sixty civilian staff members include 28 assigned to police/fire communications, 22 assigned to Jail Staff, 5 assigned to police records, 5 assigned to administrative support, 1 assigned as property clerk, and 1 assigned to computer system support. Also far from the single 1968 Ford Galaxy of the early days is the substantial present day police car fleet. Today it consists of approximately 115 police Chevrolet Tahoes and 8 Harley Davidson Police motorcycles. The Hoover Police Department car fleet is also one of the most energy-efficient and environmentally friendly in the Southeast. The Hoover Police Department is the only Department in Alabama with its own E-85 ethanol pump which is used to power police vehicles. Hoover’s use of this clean burning fuel has earned it a spotlight on the U.S. Department of Energy’s website and features in several newspapers. The Department is still growing, too. In 2007 the new Police/Fire Communications 911 center was completed at the Public Safety Center at a cost of 2.1 million. It is a model center that venders and public safety center personnel from other agencies will be traveling to see. 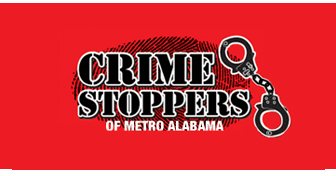 In addition to housing the Hoover City Jail, Police Records, Police Communications and the Hoover Municipal Court, the Public Safety Center is quickly becoming a home to numerous public safety related operations including the Unitied States Secret Service and Alabama Department of Forensics. It is common knowledge that the City of Hoover as it exists today in terms of population, amenities, and overall prosperity is the direct result of the construction of I-459. Plans for the new interstate can be found in sources as far back as a 1968 Carto-Craft street map, making it clear that the development of Hoover as a major shopping destination was no accident. 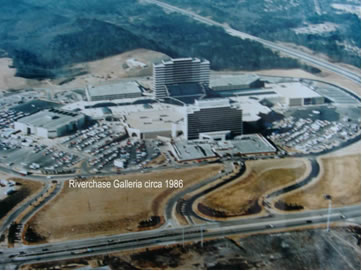 The completion of I-459 in 1980 encouraged the development of the Riverchase Galleria, which would open in 1986. As a sign of things to come for the Hoover Police Department concerning traffic management at the Galleria, on opening day in 1986, all entrances to the mall had to be closed due to extreme overcrowding inside. 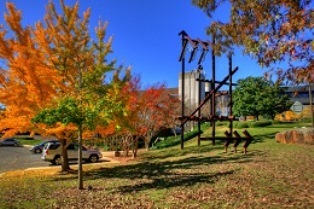 The mall, advertised as “Alabama’s number-one tourist attraction,” quickly became the police department’s number-one traffic nightmare.In order to deal with the thousands of shoppers that descended upon US 31 during the holiday season, the department required off-duty police officers to work overtime controlling traffic in the intersections surrounding the Galleria. By 1991, the police department had parked the “cone truck” as new computerized traffic controllers made it possible for officers to manage the flow of traffic using push buttons wired into the signal controller. Thankfully, officers no longer had to control traffic using hand signals and the department’s traffic control experiments with orange cones disappeared from public roadways around the Riverchase Galleria.